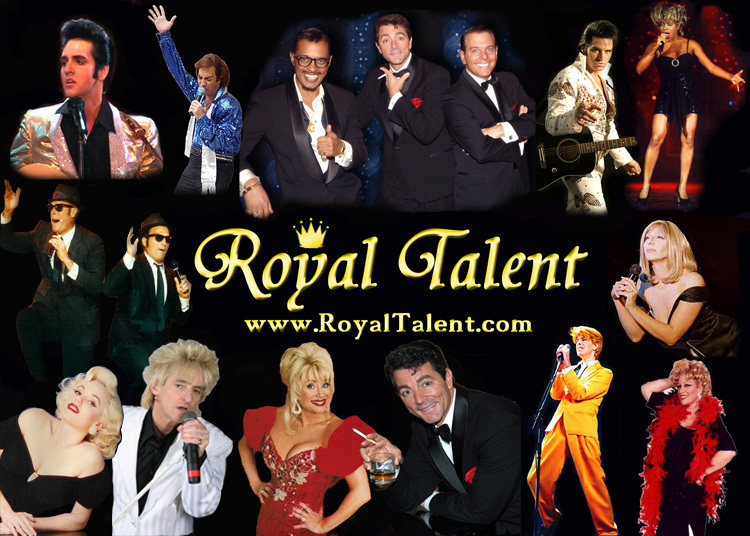 Royal Talent provides Las Vegas Celebrity Impersonators, Corporate Entertainment and Celebrity Look alikes. We Also provides Orchestras, Specialty acts, and Rat Pack Tribute Shows. We also represent Cover Bands, Tribute Bands, Cirque Acts, Comedians, Magicians, and Show Girls . We specialize Production Shows for Casinos, Corporate Events, Conventions, Trade shows, Fairs, Festivals and Special Events. Make sure to consider the professionals at Royal Talent for all your entertainment needs. We have a proven record of great events and happy clients. Royal Talent only hires the Best Michael Jackson Impersonators, Elvis Impersonators and Look Alikes. Our Tribute Acts are the best in the world! MGM Grand, Ceasars Palace,The Palms, The Venetian, The Bellagio, Las Vegas Hilton, The Rio, Treasure Island, Mandalay Bay, 4 Seasons,The Hard Rock, Green Valley Ranch, The Tropicana-AC, Grand Biloxi, MTV, TRL, CBS, ABC, NBC, Conan O’Brien, Young & Restless, Fox News, NY Jets on ABC, Ford Motors, Toyota, Burger King, Oscar Meyer, Roche Labs, Bank of America, Chase, Nascar, General Mills, Dreyers Ice Cream, Hallmark, USA Network, Theaters in Ireland, Japan, Hong Kong, Commercials in UK and Argentina, Resorts in Cancun and Dominican Republic, Costa Rica, Bahamas, Sherwood Hotels. Also included are Hallmark, Time Warner, Budweiser, Bausch and Lomb, Ronald McDonald, The Special Olympics, Mercedes and BMW. Some of our top acts include Elvis, Neil Diamond, Rod Stewart, Tina Turner, Michael Jackson, Whitney Houston and the “Beatles” to the disco sound of the Bee Gees including Country legends with Willie Nelson and Garth Brooks. The Best Look a likes in the business.